Once again, here's your friendly amazon link, a must buy for SP fans. Ummmm, the cover really spoilt what will happen in the Drama CD lol, buy it if you want to know what REALLY happened inside heh. I'll probably try to do a brief summary of the whole Drama CD next week or something. Alright, time to type the lyrics for Otoboku OP~! PS: I'm halfway through translating the Urahime Mai Otome Doropanda Tours pages ... so yeah expect it to be released next week too. Just listened to it and this way too boring. I think St.Miator was better. I thought Yaya gonna make me laugh and hot but it turns out nothing much. Amane as usual, BORING. Nagisa was dead funny. Especially when Shizuma caught her eating like never ate before. Chikaru was hillarious. training her in ... some other ways lol. hint; bedroom activities. Whoa I believe Kaname actually means bed activity. Compare to Miator, Spica was all common when it comes to bed stuff. What is wrong? I can't download it. and about yamibo, i can't really read chinese , so it would be great if something could provide a link. does anyone still have part 1 for yamibo? because ysi has already reached its download limit. sadly the links on yamibo is dead and I think I can get the torrent. yamibo doesn't work, any other links to it that people can post. onegai. btw even if yamibo does work i wouldn't be able to get in anyways, because i have no idea how to register there. So unless someone creates a id that they will share with everyone, i hope there's another link. 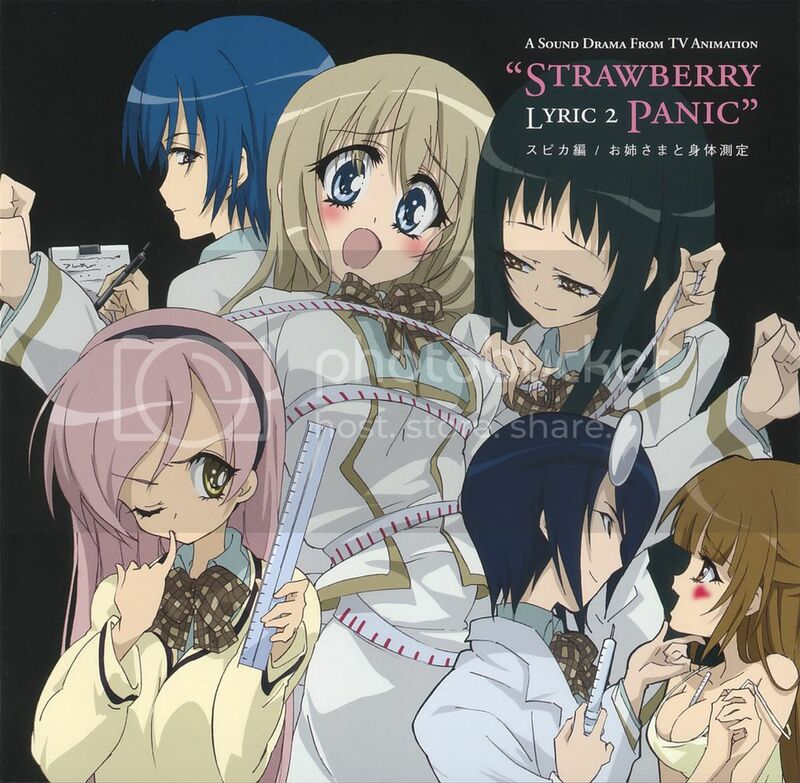 Ayuki, great job with the page, I'm from Mexico and I'm big fan of Strawberry Panic!, my favourite Yuri Serie (together Kannazuki no Miko) sadly, it's too hard to find anything of new anime series in my country, and buy the CD is the same trouble, but in the end internet is the answer. Finally I Find the CD but it is a big file and I need Cut the tracks.... due to this here is the reason of my post. Sorry If I Trouble You But I'm in search of one thing: Do you know how length is every song in the CD? I hope if there is a answer and thank you for your attention!! Sorry if my english is weird!!! You shouldn't apologize for you English. Not everybody in the world can speak English perfectly, so that doesn't mean that you have to. To answer your question: they aren't really songs in the CD. They're more like conversations, but without the animation. They're around 1 minute and a half each, if they're the same as the Miator Compilation. (I haven't finished downloading yet). And thanks a lot for the torrent. I've been looking all over for it! anybody noes where i can get the song that the spica sch's choir always sings? 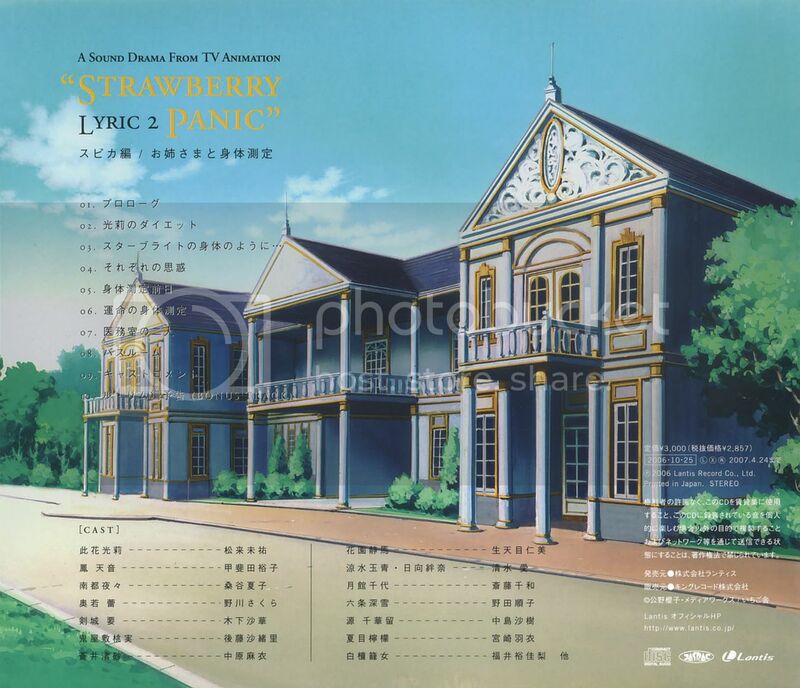 the song name is 'ketakaki yuri no' by hirano yoshihisa... i wan it so badly... :D its a really nice song! I have the 'ketakaki yuri no' song to whomever wants it. -pokes anonymous person- Just email me at kibaookami@gmail.com and I'll get back to you asap as I always check my email. x3 Too bad they didn't have a version in the OST where Hikari sang it though...^^. About the torrent that Sir Drk Sha wrote,.. I want it sooo Badd...! !